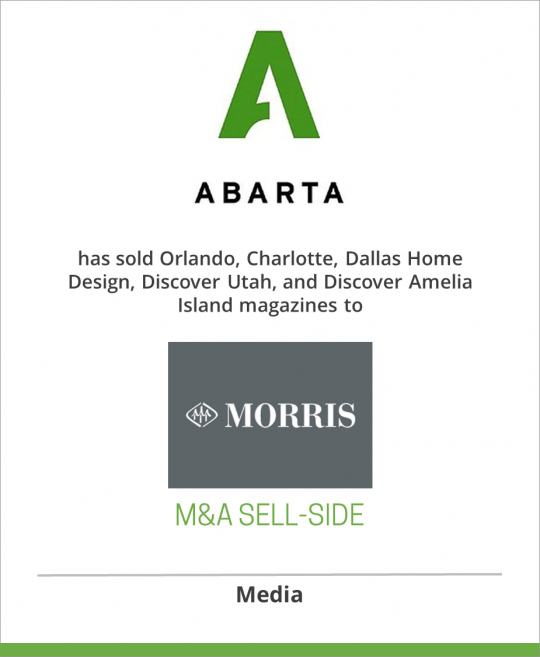 ABARTA Media Group, based in Miami, Florida, is one of the country’s leading publishers of city and regional magazines – with publications in Florida, Missouri, North Carolina, Texas, Utah and Colorado – as well as destination maps, dining guides and other custom publications. ABARTA Media Group’s parent company, ABARTA, Inc., is a $200 million (revenue) diversified company whose primary business includes Coca-Cola bottling franchises, oil & gas operations and financial services. It also publishes a daily newspaper, The Press of Atlantic City. Orlando Magazine, a monthly with circulation of 26,000, has been published for more than 50 years. Charlotte: The City Magazine, a monthly with circulation of 26,000, is the largest city magazine for the nation’s second-fastest growing metropolis. Dallas Home Design, a monthly with circulation of 14,538, shows off the fabulous diversity of luxurious homes in the Dallas/Fort Worth area. Discover Utah and Discover Amelia Island are in-room visitor guides distributed in hotels and resorts. Morris Communications Company, LLC, a privately held media company based in Augusta, Georgia, has diversified media holdings that include newspapers, magazines, outdoor advertising, books, visitor guides, radio broadcasting and online services. Morris Communications publishes city magazines in Athens, Augusta and Savannah, Georgia, and Jacksonville, Florida, and cover the people, issues and events of their respective communities. The Web site for Morris is www.morris.com. Sold to Morris Communications Company, LLC.